Charming house with beautiful garden, close to the beach. Free WiFi! Beautifully restored in the original Sardinian style, this vacation home offers you and your family the ultimate 'getaway'. It is located in the quaint village 'Riola Sardo', within a short drive from some of the most spectacular beaches in the Mediterranean. Mari Ermi and Is Arutas with their white quartz sands and aquamarine waters are particularly enchanting. With a fully fitted kitchen; one room with 2 single beds/double bed and bathroom; one bedroom with a double bed and shower/bathroom; a gallery/tv area and a living room with fireplace this holiday home provides you the perfect position from where to sample the delights of Sardinia. Free wireless internet is also available. Take advantage of the cultivated, enclosed garden with two large shaded verandas for an evening bbq and outside dining. Feel free to sample some of the lemons, oranges, persimmons and pomegranates from our fruit trees! In Riola you can avail of delicious home made pastries for breakfast ,artisan ice-cream, home made liquors (the 'Finocchietto Sardo' is a 'must try'!) and locally produced oil and wine (Vernaccia). Getting there: Arriving at either Cagliari, Olbia or Alghero airports you can reach the motorway SS131. Close to Oristano, look for the exit 'TRAMATZA SOLARUSSA' then follow the signs to SAN VERO MILIS. Once in SAN VERO MILIS follow the signs to PUTZU IDU and then RIOLA. From CAGLIARI Airport it takes approx 90mins, from OLBIA just over 2 hours and from ALGHERO (via SASSARI) 2 hours. For the scenic route from Alghero Airport just follow the coast road in the direction of Oristano via Bosa. To enjoy the trip allow at least 3 hours time! We offer a good choice of books and comix in many languages, with the concept of shared library: take one, leave one! 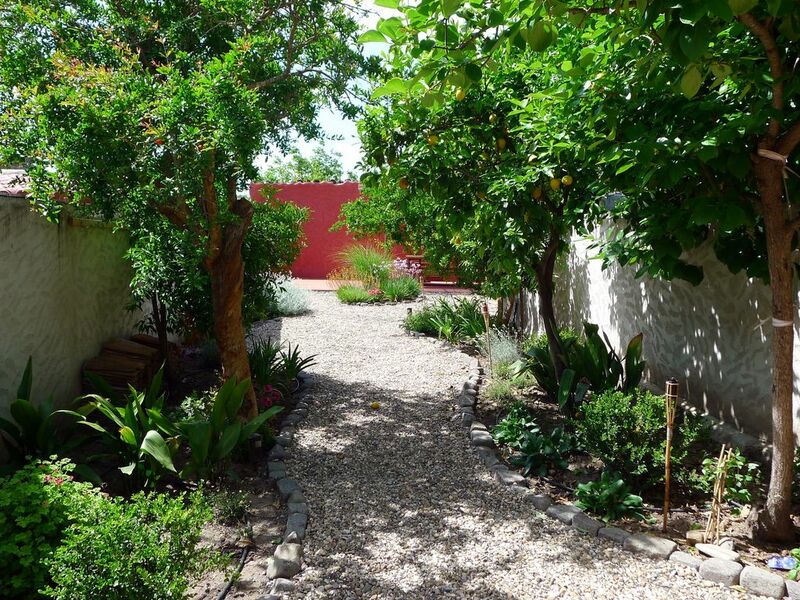 We are proud of our little, luxurious garden, always perfectly well taken care of by Nicola! We have just returned from a fantastic 11 nights at this wonderful property. The house has everything you need and feels so comfortable. The garden is beautiful and ideal to enjoy day or night. The location is so close to some amazing beaches, a brilliant holiday! We loved Putzu Idu, Sa Mesa Longa, Mari Ermi and Roca Tunda. Don't forget to try out the baker's in Riola too! Very nice stay in a very nice house with plenty of place and proper equipment in the kitchen, bathroom and air conditioning in the rooms. A very lovely garden where you can enjoy your meals in the shade. Rioja is a little town that needs discovery : nice Pasteria, butcher, and locals are friendly and helpful. My family and I spent two wonderful weeks in this house. It had everything we needed . It was spotlessly clean , beds very comfortable , wonderful hot outside shower , beautiful garden , really was a fantastic stay . Just 10 minutes by car to the most amazing beaches , fantastic cake shop in the villlage which is just too good to miss ! I wouldn't hesitate recommending this beautiful accommodation . A real treasure . Hello Monique and friends, we are glad you enjoyed your stay in our house and that you took advantage of its location to visit its splendid surroundings.